This was a week of looking at the familiar in a whole new way both in and out of the studio. It’s a good exercise for me to recognize in my work and daily life. I was lucky to attend a Billy Joel concert this week with my husband, daughter and her boyfriend. I’ve seen Billy numerous times over the years. His music and lyrics resonate with me and my family. I love his songs now as much as when I first started listening. Not only does the music evoke memories, but I continue to hear his lyrics in new and meaningful ways as the years pass by. To me, that is art and what I am striving for in my own work. Part of what keeps me going to the studio is looking at familiar shapes in new ways. And on top of that, when someone tells me that they still use a piece of work I made many, many years back – it’s a good feeling. My neighbor Candace has a bountiful garden and I am the lucky recipient! Here is a chocolate zucchini cake I made sitting on one of my wheel thrown 'original' cake plates from 2003. Lucky for me, I have friends with great ideas! 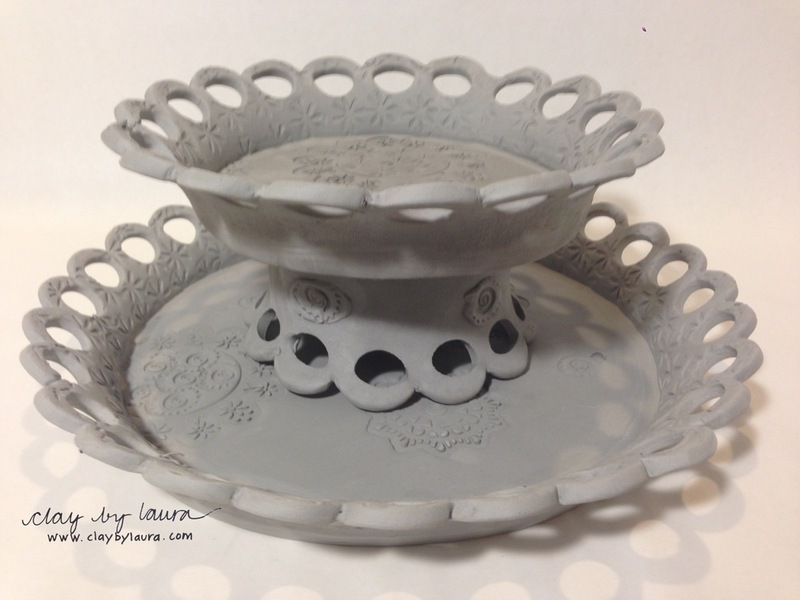 In this new rendition of my hand-built cake plate, I've separated and added pieces to include a bowl that can also be used as a stand and an additional smaller plate that can be stacked vertically! I've learned to add curves to my hand-built mugs. I think this shape mimics what I used to throw using the wheel. I am also playing with use of matte and shiny surfaces to highlight the texture. I made myself a set of dishes using hand-building methods. It's been on my 'to-do' list for quite some time!